As hundreds of thousands rallied in answer to army General Abdel Fattah al-Sisi's call for support to tackle Egypt's recent violence, dozens of pro-Morsi demonstrators died and over a thousand were injured in a rival rally held overnight in the capital. The exact number of people killed and wounded in the protests remains unclear, with conflicting reports emerging from various news sources. While the BBC is stating figures as high as 100, Reuters is putting the number at 70— and the state health ministry says only 38 people had died, and just 180 injured. In contrast, Al Jazeera’s Egypt television station is claiming that some 4,500 have been injured and over 120 have been killed. Thousands turned up in Tahrir Square Friday in support of the army general, who called the rally in the hopes of a popular mandate to curtail the region's escalating violence. Simultaneously, tens of thousands of pro-Morsi demonstrators continued their sit-in protest at Cairo’s Rabaa al Adawia mosque, incited by conspiracy charges being filed against the ex-leader earlier in the day. 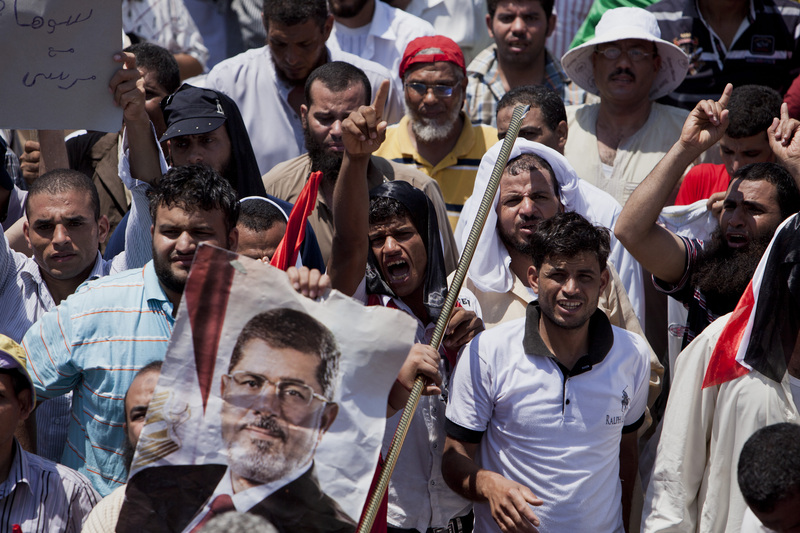 According to reports, the violence erupted after a small group of Morsi supporters attempted to form a blockade across a main road overnight, after which security forces responded in full force. Muslim Brotherhood spokesman Gehad el-Haddad told Reuters that the army was firing live bullets at the protesters. "They are not shooting to wound, they are shooting to kill," Haddad said. Clashes between Muslim Brotherhood supporters and anti-Morsi protesters also broke out in Alexandria, leaving another 10 people dead. Meanwhile, it has emerged that Egypt's ex-leader Mohammed Morsi will probably be transferred to the same Cairo prison that holds former President Hosni Mubarak. Worst reunion ever?